Through sports training and competitions, Special Olympics helps people with intellectual disabilities achieve joy, acceptance and success. They gain the confidence that comes with achievement. They feel empowered. Our Athlete Leadership Programs can take athletes even farther -- as leaders and spokes people respected in their communities. to individuals and families. The Athlete Leadership Programs also provides a way for athletes to showcase talents and interests that may have gone unnoticed. 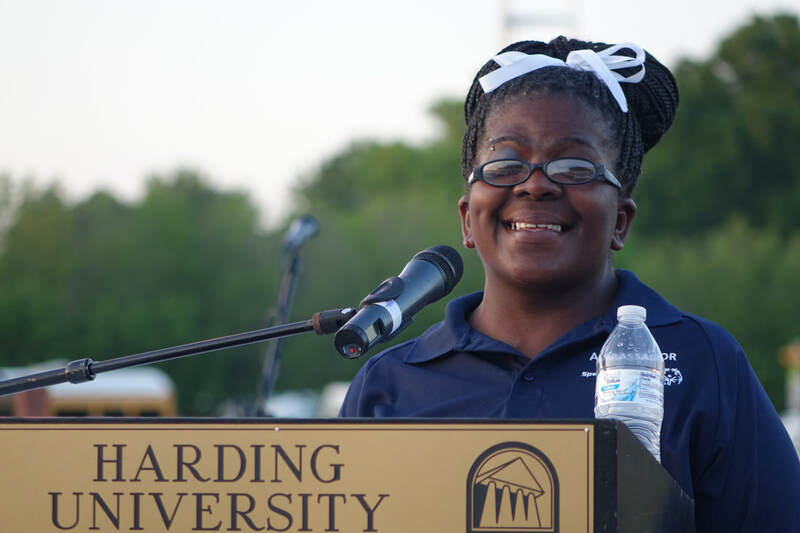 Area and global messengers are leaders who communicate powerful declarations of the hope, acceptance, dignity and courage of Special Olympics athletes around the state. They help spread the message and vision of the Movement as well as the benefits they have gained by participating in Special Olympics. Messengers are instrumental in developing future partnerships for Special Olympics Arkansas as they speak to prospective partners and present about our overall program and initiatives. Messengers currently commit to a 2 year position and meet at least 3 times a year for professional development training such as: speech writing, interviewing skills, and presentation skills. The AIC is a forum for athletes to report to other athletes and program leaders what is happening in their areas, voice their opinions about important issues, and gain leadership training and experience. Each area should have representatives that sit on the council for a two-year term. The AIC participates in event surveys and program feedback year-round. Athlete Nutrition captains are an organizationally internal leader responsible for assisting with planning and promotion for area live health education fairs, attending fairs in their area to support the program, following up with fellow athletes and encouraging their success as they start working for a healthy lifestyle. Nutrition Captains are instrumental in increasing internal focus on health and wellness among other athletes and members of the Special Olympics Arkansas community.